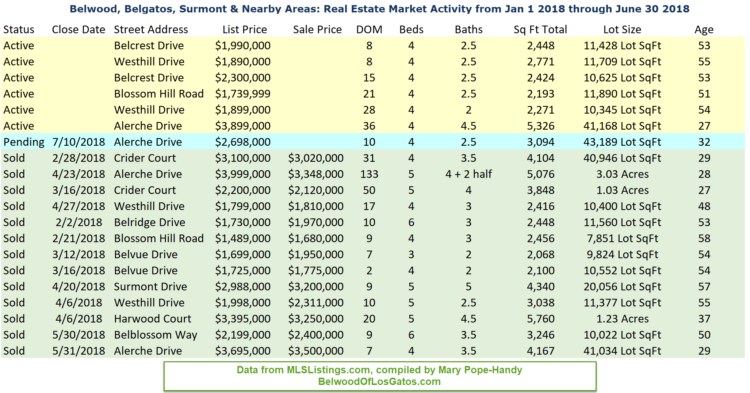 What’s going on with the real estate market in the Belwood, Belgatos, Surmont, and nearby areas of east Los Gatos? Here’s a quick update of the year to date listings and sales activities, taken from the MLS. There is only one pending sale, and no properties at all in the area which closed in June. We had steady rate of sales closed earlier in the year: three in February, two in March, five in April, two in May. For those tracking the absorption rate, which is the rate at which homes would sell if no new properties come on the market, this is a bit of a surprise. Zero homes (sold / closed in the last 30 days) divided by 6 active listings = an infinite months supply of inventory. Of course, it is not truly that dire, since there were 2 closings in late May and there’s one pending sale (went into contract June 15), but it does suggest that home buyers may have put the brakes on. 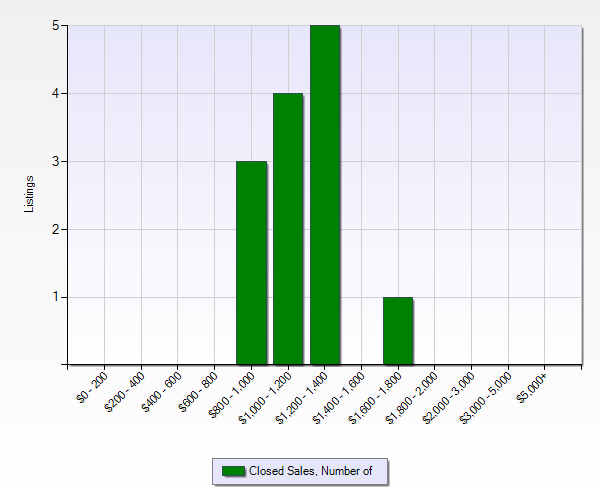 We are seeing this drop in sales activity across the valley in many areas, so it’s not just this corner of 95032. Is it just a big rise in inventory that is causing the market to stall out a little? In some areas, homes have continued selling at the same pace, but with fewer offers over the last 6 weeks or so. 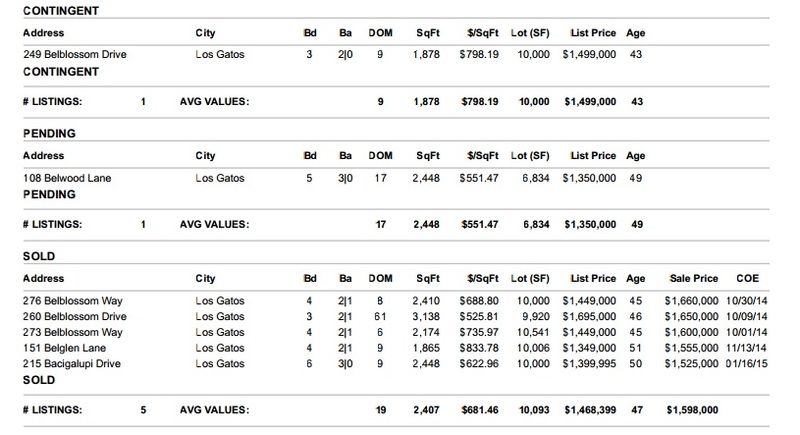 Those areas may not have had as large an inventory jump as we have seen on the east end of Los Gatos. Here’s a look at the inventory for single family homes for sale in 95032 with Campbell Union High School District (so Leigh or Westmont High) from July 2012 to July 2018. Inventory is up, but not to an unprecedented degree. There were more in June, and June’s inventory was not too different from most of the recent years (2014 and forward). A holiday week is often slow, so I would encourage people thinking of selling to not get discouraged. Part of what we are seeing could simply be a seasonal trend – summer is normally a bit of a “slowdown” period in real estate, with things picking back up again in early to mid September. Last year we did not see seasonality at all, as the market was raging hot through December. If you are interested in buying or selling a home in east Los Gatos or anywhere in Silicon Valley, please reach out to me and we’ll find a time to talk and see if we might be a fit for working together. 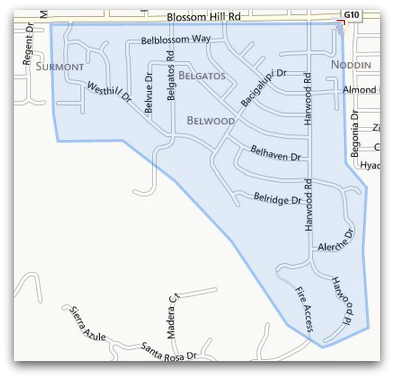 Neighbors often want to see an update on the immediate neighborhood and sale prices of houses that have sold and closed escrow. 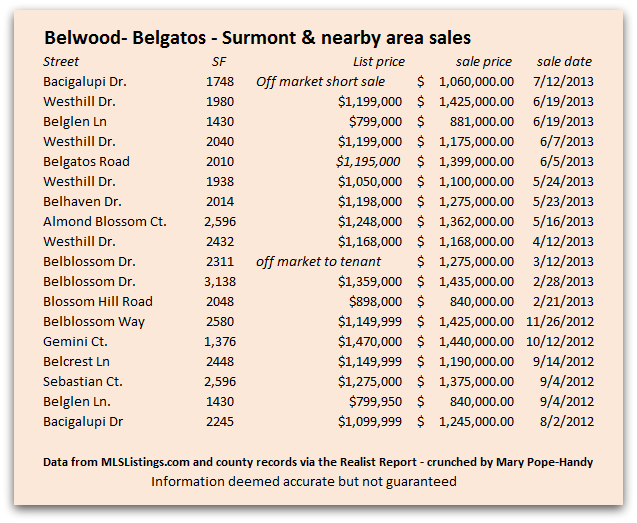 Here’s a current snapshot of the real estate market in Belwood, Belgatos, and Surmont (and adjacent to the contiguous neighborhood). In addition to these closed sales, there are 2 in various stages of “under contract”, and there was 1 duplex sold earlier this year, too. Interested in buying or selling a home in the area? Please reach out to me with an email or a phone call. Interested in knowing what your home’s probable market value is with today’s market? Please give me a call or write me an email and I’ll be very happy to preview your home and provide you that information with no obligation: 408 204-7673 mary (at) popehandy.com. I’m a 20 year real estate veteran in Los Gatos, a top producer, and a Belwood resident since 1999. 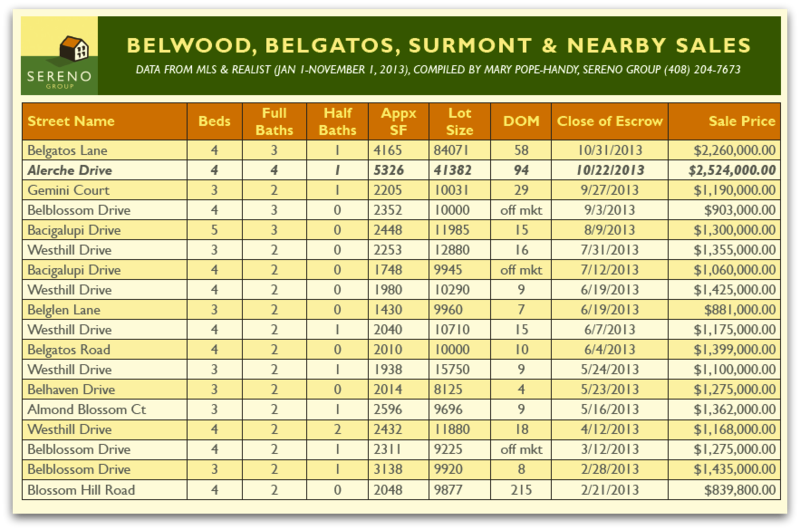 What are homes selling for in Belwood, Belgatos, Surmont and nearby areas? Houses in the Belwood, Belgatos, Surmont and nearby areas priced under $1,500,000 are selling at a very healthy rate, many with multiple offers and significant overbids. In the last year or so, there have been 18 sales of single family homes in this area (see map at right). Of those, 16 were on the open market of of those 16, 13 sold for more than list price. Two properties sold “off market”, or not on the multiple listing service with a real estate professional involved. One of them was a sale from a landlord to tenants already in the property. The other was an off market short sale. As of this writing, there are 2 pending sales in the neighborhood, both between $1.2 million and $1.5 million. Additionally, there are 3 properties available for purchase. They range in price from $2.4 million and $2.8 million, and all have been on the market for more than a month. Below, please have a look at what has sold – street names rather than precise addresses are used to provide privacy to the owners. 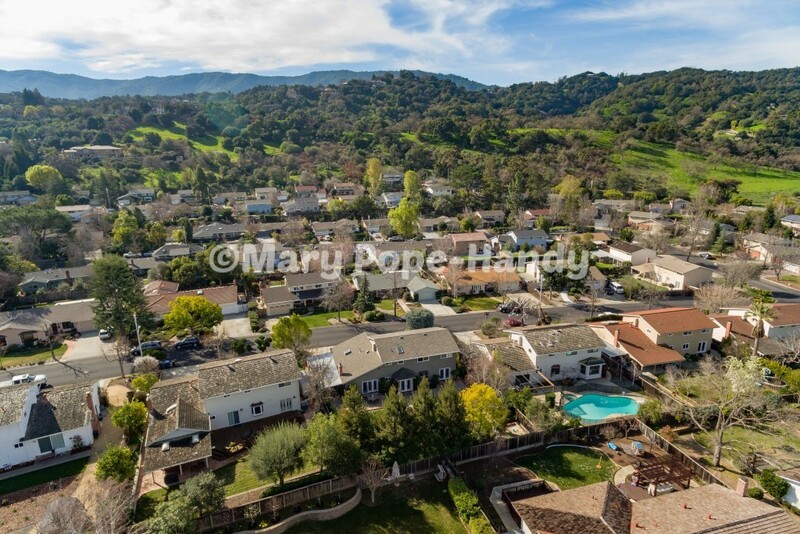 Interested in selling your east Los Gatos home? Please call or email me for a confidential, no obligation consultation today. 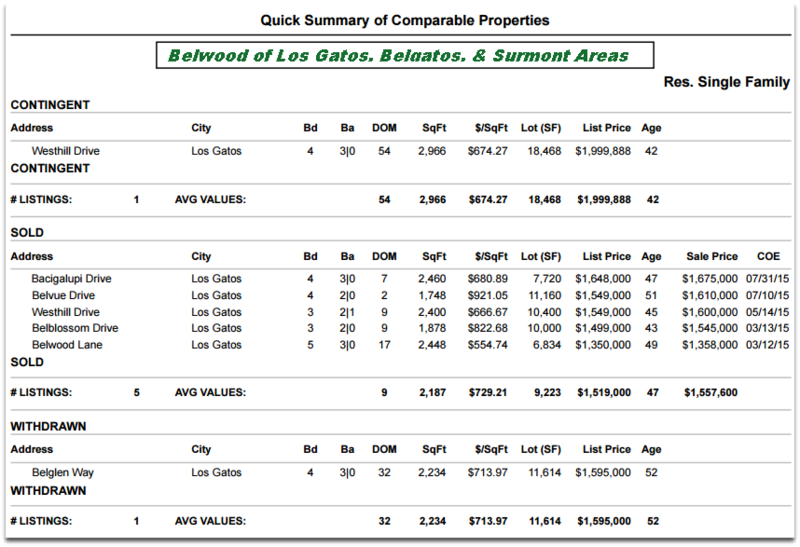 How’s the real estate market for the Belwood of Los Gatos, Belgatos and Surmont neighborhoods of Los Gatos? Today I present some detailed views of the state of the real estate market in 2012, viewed from several angles. This is a lengthy article, but one I hope my neighbors and would-be neighbors will find very helpful. 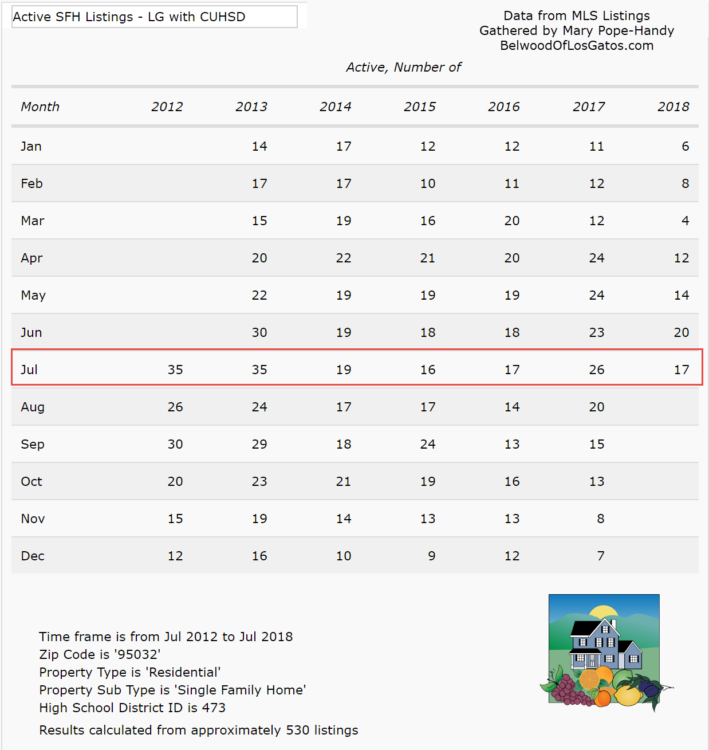 Inventory was low across all of Los Gatos and Silicon Valley, and turnover in this corner of east Los Gatos 9part of the 95032 zip code) is never high, so it’s not surprising to learn that a mere 13 houses sold over the last year. Most home owners would like to know whether values are rising or falling, how tough it is to sell a house, and whether or not homes are selling over the asking price. We’ll have a look at these questions, and more, using graphs I created from our local real estate multiple listings provider, MLSListings.com. There were 13 sales of houses in 2013 – not too many for a neighborhood with more than 300 houses! There were four others which did not sell, however. One is currently for sale, and 3 more are cancelled, expired, or withdrawn. In every market, no matter how “hot”, some homes do not sell. This is important to remember. Too many home owners get euphoric about the sales prices and multiple offers which they hear about. What’s usually not considered is the “market rejection” that other properties get. It is a sobering balance to the multiple offer frenzy stories which one hears. This first graph displays the closed numbers of sales by price point. This is helpful not just for sellers, but home buyers interested in purchasing here. 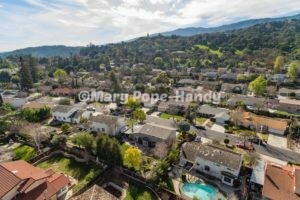 Last week I got an email from a resident of Santa Clara County indicating a desire to see properties here with 2200 square feet or more available at under $1,000,000. Is that possible? Let’s see. In the graph above, we find that three properties sold here between $800,000 and $1 million. We do not yet know from the data anything more about the houses, whether they were small, big, regular sales or distressed properties. A quick look at the MLS just now shows that all of the sold houses were regular sales except one, a short sale on Belwood Gateway which was in that lowest pricing tier (and which took about 2/3 of a year to sell). From the time the house is showing on the MLS as active or available, how long until there was a ratified contract? In most cases, not long at all. For the lowest price group, the average days to sell is badly skewed by the short sale on Belwood Gateway – that one took 213 days to sell due to transactions falling through and the difficulties of getting a distressed property closed. 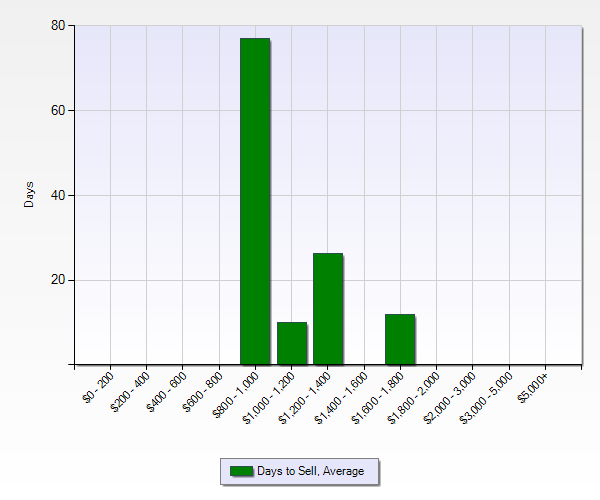 When I eliminate the short sale from the mix, the average days on market for the other 12 properties was a very fast 17. The longest was 66 and the shortest was 2. The graph below shows the days on market of all sold houses by price point. Although it appears that the least expensive homes are the hardest to sell, that’s not really the case. The short sale tilts the average.